1 – Looking good takes some work. But once you’ve got the look, it can serve you for a lifetime. Don’t change your style every day, but avoid becoming stale and try a new color or fabric sometimes. 2 – Have at least one good suit in your closet. Go ahead and splurge on a high-quality piece that can be worn to multiple events like weddings and work functions. A suit should cost a week’s pay. That’s what we’ve learned since we started in 1913. 3 – Check yourself out in a mirror a few times a day. It’s not vanity; it’s like spellcheck for your look. 4 – Look at other men in the street, at store windows, at magazines and online. If you like how David Beckham looks in a photo, imagine yourself in the same suit, with or without the tattoos. 5 –Have seasonal options. In the fall and winter months, try a navy or charcoal suit in tweed. In the spring and summer, opt for a light gray or tan suit in a tropical weight wool. 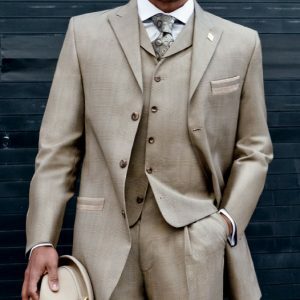 6 – A suit is an investment in yourself, so take care of it. Use a high quality hanger and don’t dry clean it too frequently. See how the suit looks on you, not on a hanger, before you decide to get it pressed. 7 – Meet your friend, the tailor. A tailor can take into account your style preferences, while making sure you look good! A tailor will know the best cut for your body type, and over time, the best style for your personality. 8 – Build from white and blue shirts. These pieces are the backbone to a sharp wardrobe, and also flattering on most complexions and body types. Branch out into patterns, like stripes, as your personal style evolves. 9 – Ditch the denim for a pair of trousers. Well cut and classically styled pants will make you look professional at work, and easily transition into a sharp look for happy hour. A good pair of slacks has a drape and crease that looks crisp and stylish. 10 – Be classic, not trendy. Mainstream fashion trends change too fast to make useful wardrobe staples. Instead of buying a new pair of pants or shirt every few months, stick to the classic styles that will help you stay within your budget.